Cranes breeding and migrating in Alaska are part of a complex of lesser sandhill cranes found from Siberia across northern Canada. They are considered a separate subspecies from greater sandhill cranes found in southern Canada and the lower 48 states. Sandhill cranes are among Alaska’s largest birds. They are wading birds that have long black legs, long necks, and black chisel-shaped bills. Adults stand almost three feet (0.9 m) tall and have a wing span of six feet (1.8 m) or more. Mature birds are an ash-gray color with a bright red forehead. Immature birds are quite mottled with coppery or rusty feathers and lack the red forehead of adults. Adult plumage is attained at two-and-a-half years. In the past, the sandhill cranes in Alaska were called “little brown” cranes and were thought to be a separate species based on their color. Cranes arrive at their nesting grounds in early to mid-May. They nest on wet tundra, marshes, and muskegs. Their nests are often simple affairs — shallow depressions in the soil lined with dry grass and feathers. Normally, two eggs are laid but anywhere from one to three eggs is also seen. Eggs are spotted and gray to brown in color, with both sexes incubating them until they hatch after about 30 days. 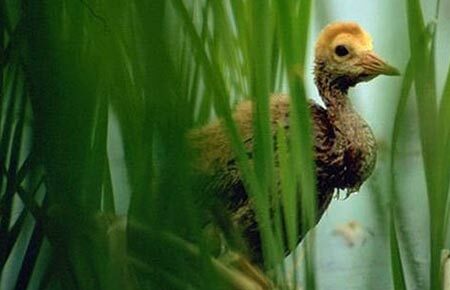 Nestlings are able to walk immediately after hatching. The young are frequently fed food items caught by the adults but can also capture insects on their own from an early age. In two to two-and-a-half months, the young have fledged and are ready to undertake the southward migration with their parents. Omnivorous ground feeders, cranes eat frogs, rodents, insects, bulbs, seeds, and berries as well as occasional seashore delicacies. They have adapted well to agriculture and during the winter and on migration, feed largely on waste grain and small animals associated with farm fields. The dance of the sandhills may be one of the strangest breeding displays on the tundra. Often called a mating dance, display activity reaches a peak in late winter and early spring, but it has also been seen at other times of the year when two cranes meet. The ritual starts with a deep bow followed by great leaps, hops, skips, turns, and more bows. This dance can go on for many minutes. Cranes are extremely wary birds and hard to approach. Their long legs enable them to easily outdistance a person walking on the uneven tundra, but they will take flight if closely approached. Except for the nesting season, cranes are social birds that feed together and occupy safe communal roosts at night. 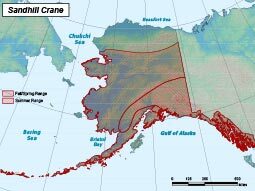 Almost all lesser sandhill cranes in Alaska pass through two migration “funnels.” One is the Copper River Delta through which about 20,000 cranes fly on their way along the Pacific Flyway to and from central California. The other is in the Tanana Valley near Delta Junction-George Lake. In early May and mid-September, 200,000 Mid-continent cranes pass through this northern funnel, with as many as 50,000 passing through per day during the peak. At least 50,000 cranes nesting in northeast Siberia travel this route and cross the Bering Strait during these migrations. Another 8,000 birds pass through the Yukon Flats area near Eagle. Both northern groups travel the Central Flyway through Canada and the plains states to and from their southwest wintering grounds. When taking off, flocks of cranes ascend in great circling columns, riding thermal currents of rising air, then form into “V”-formations. They fly very high and appear to be primarily daylight and fair-weather migrants, traveling as far as 350 miles a day. There are two distinct groups of sandhill cranes in Alaska. The more populous northern group breeds on the Yukon-Kuskokwim Delta, in the Interior, and along coastal areas throughout western and northern Alaska. These birds, along with others from Siberia and Canada, form the Mid-continent Population of lesser sandhill cranes that winters in Texas, the southwestern United States, and Mexico. A smaller group, the Pacific Flyway Population, breeds in the Bristol Bay lowlands, on the Alaska Peninsula, and in the Cook Inlet-Susitna Valley region. A few nests have also been found in Southeast Alaska. This group winters in the Central Valley of California. They prefer grassland, bogs, marshes, and marshy edges of lakes and rivers for nesting. When it is not breeding season, they roost in open expanses of shallow water. The northern group breeds on the Yukon-Kuskokwim Delta, in the Interior, and along coastal areas throughout western and northern Alaska. The Pacific Flyway Population, breeds in the Bristol Bay lowlands, on the Alaska Peninsula, and in the Cook Inlet–Susitna Valley region. Pairs breed annually. Females lay 1–3 (usually 2) eggs which hatch 30 days later.